At the request of the GLA and Historic England, the applicant is preparing amended drawings to address the Council’s concerns. Following submission of the amended drawings, the Council may decide to hold a 21 day consultation for local residents and others to comment. I understand that this possible consultation will not invalidate all the comments made so far. The GLA and Historic England have postponed their comments until they have studied the amended drawings. The Council has received about 147 letters/emails objecting to the planning application (including letters from the Victorian Society, SAVE Britain’s Heritage, Greater London Industrial Archaeology Society and East End Preservation Society). A 38° petition objecting to the proposals has been signed by 679 people. My two online petitions were emailed in on 23 January 2017 (first with 284 signatures, second with 125 signatures; and paper versions of the two petitions were taken in on the same day (first with 41 signatures and second with 34 signatures). Fortunately, the two petitions are still online (first now with 311 signatures and second with 144 signatures). If you have signed the first petition, please consider signing the second petition. Explain the relevance of the Victoria Park Conservation Area and the fact that the (now listed) former chest hospital is not only the principal named building in the conservation area but is also in the setting of the Grade II*-registered park. Please therefore sign both petitions to stop fake heritage and make sure that the listed 1855 main hospital building is properly repaired and adapted for residential use as a worthy and honest memorial to the specialist hospital which served the people of North and East London for 160 years. We, the undersigned, object to PA/16/03342 and 03343 because the three proposed residential blocks would dominate rather than defer to the Grade II-listed 1855 main building, and their height, scale and bulk would also fail to preserve the northern and southern elements of the parkland setting, which makes a positive contribution to the significance of the listed 1855 building and this part of the Victoria Park Conservation Area. This part includes the Park View Estate and the Grade II*-registered Victoria Park, which has group value with the Grade II-listed 1855 main building (List Entry Description No. 1433870). The parkland setting of the Park View Estate links the parkland setting of the former London Chest Hospital with the parkland of Victoria Park (via the narrow open space of the Regent’s Canal Conservation Area) so that parkland pervades this extensive part of the Victoria Park Conservation Area. The three proposed residential blocks would also create a massive barrier along the west side of St James’s Avenue which would sever the important parkland link between the hospital site and the Park View Estate and the registered park (on the north side of the canal). The massive barrier would also dominate and have a detrimental impact on the lower set-back buildings on the east side of St James’s Avenue: including the Grade II-listed Church of St James the Less, which has group value with the Grade II-listed 1855 main building (List Entry Description No. 1433870). The massive barrier would also destroy the balanced streetscape created by all the east side buildings and the existing low former hospital buildings on the west side of St James’s Avenue. The harm caused by the proposed three residential blocks to the settings of the listed hospital building, listed church and listed vicarage and to this extensive part of the Victoria Park Conservation Area would not be outweighed by the proposed public and heritage benefits which are being provided solely to outweigh the “less than substantial harm caused by the demolition of the Grade II-listed South Wing”. Tower Hamlets Strategic Development Committee should therefore please refuse consent (under NPPF paras. 132 and 137) or defer its decision to allow the applicant to revise the application to create smaller and lower residential blocks which defer to the Grade II-listed 1855 main building, better preserve its parkland setting and maintain the parkland link with the Park View Estate and the Grade II*-registered Victoria Park (via the intervening section of the Regent’s Canal Conservation Area). Please sign this petition and the (first) London Chest Hospital petition, which is about the alterations to the listed building. We, the undersigned, object to PA/16/03342 and 03343 because the three proposed residential blocks would dominate rather than defer to the Grade II-listed 1855 main building, and their height, scale and bulk would also fail to preserve the northern and southern elements of the parkland setting, which makes a positive contribution to the significance of the listed 1855 building and this part of the Victoria Park Conservation Area. This includes the Park View Estate and the Grade II*-registered Victoria Park, which has group value with the Grade II-listed 1855 main building (List Entry Description No. 1433870). The three proposed residential blocks would also create a massive barrier along the west side of St James’s Avenue which would sever the important parkland link between the hospital site and the Park View Estate and the registered park (on the north side of the canal). The barrier would also dominate and have a detrimental impact on the lower set-back buildings on the east side of St James’s Avenue: including the Grade II-listed Church of St James the Less, which has group value with the Grade II-listed 1855 main building (List Entry Description No. 1433870). The barrier would also destroy the balanced streetscape created by all the east side buildings and the existing low former hospital buildings on the west side of St James’s Avenue. Compare the existing and proposed front elevations of the main building from Crest Nicholson’s planning application to Tower Hamlets Council (consultation period ends 23 January 2017). Look at elevations when reading the online petition and background notes. Please sign the Online petition to Tower Hamlets Council and encourage others to sign ASAP. The demolition of the repaired original 17th century country house-style roof (with gentle slopes and several flat tops), and the demolition of the original albeit shortened ventilation tower would result in the unacceptable loss of two external key elements of the 1855 main building, which is the most important part of the Grade II-listed former hospital building. The supersized new roof is only needed to provide about 12 more flats and with its steep slopes containing two tiers of dormer windows and one long flattish top it would be a grand city-type roof in conflicted juxtaposition with the 17th century country house-style façade; the new higher ventilation tower is only needed so that it can be seen above the taller new roof and, with its three added conjectural features, would also be taller than the existing ventilation tower. The fake heritage roof and fake heritage ventilation tower would be fundamentally dishonest and totally misleading; and would also be seriously detrimental to the significance of the 17th century country house style façade (the 1855 main buildings; third and only surviving key element) and its positive contribution to the character and appearance of the Victoria Park Conservation Area. The demolitions and replacements would cause substantial harm to the Grade 2 listed 1855 main building (and its Grade 2 listed 1892 sanitation tower) and harm the Victoria Park Conservation Area; and the substantial harm would not be outweighed by the proposed public and heritage benefits, which are being provided solely to outweigh the “less than substantial harm” caused by the demolition of the Grade 2 listed south wing. Tower Hamlets Strategic Development Committee should therefore please refuse consent (under NPPF Para 133) or defer its decision to allow the applicant to revise the application to include the retention and proper repair of the repaired original roof and the surviving lower part of the original ventilation tower and its 1934 dome. The structural engineer’s report states that the roof is “in sound condition”; and, although there have been repairs and replacements “over the life of the building”, it only needs localised repair. The new supersized roof (over the narrow 1855 main building and proposed back addition) is, therefore, only needed to provide a total of 18 flats on two attic floors. Whereas the repaired original roof with localize repairs could provide six flats on one attic floor. Clearly, the Heritage Statement’s claims that “the roof suffered bomb damage and has been largely renovated…” (3.22) and the roof “retains very little of its original fabric” (5.13) are both gross exaggerations. Furthermore, the fact that some of its timbers are not original does not diminish its significance but illustrates its history as a WW2-damaged roof, which was sufficiently substantial for most of its timber roof trusses to survive. The roof is not fully described in the list entry description (no.1433870) but this does not mean that it is the least significant part of the Grade 2 listed 1855 main building. The first reason for designation (listing) in the LED is “architectural interest: built to a dignified design in late C17 style”; and as the shallow roof with gentle slopes and a flat top is a characteristic feature of the 17th century country house style, the repaired original roof is a key element and very significant part of the Grade 2 listed 1855 main building. In the applicant’s design and access statement section 05 it is claimed that the replacement roof “will not harm the listed building, and will enhance its appearance as a composition”. No real evidence is provided in support of the replacement roof’s design, nor the extent to which it “relates to the overall architectural composition”: as required by Historic England in its letter of 5th May 2016 (Heritage Statement pages 70-74). This letter also referred to a replacement roof in “the same style” as the existing roof and the need for a “taller, more steeply pitched roof to complement the architecture of the building”. Clearly, the applicant’s proposed replacement roof is not in the same style as the existing roof and would not complement the architecture of the building. The ventilation tower is also a key element because it is the largest and the most visible surviving part of the Chest Hospital’s very sophisticated warming and ventilating system. This was designed to create the warm, dry microclimate thought necessary at the time for the treatment of pulmonary tuberculosis. The London Chest Hospital and the Brompton Hospital in west London were the only two specialist chest hospitals in England with warming and ventilation systems designed to create a warm, dry microclimate. The first part of the Brompton was built in the 1840s but its first and second warming and ventilation systems were very unsatisfactory, and the second system was replaced by a more satisfactory system in 1876. The unique and highly satisfactory system at the London Chest Hospital remained in use from 1855 to 1918 when hot water radiators were installed. The structural engineer’s report states that although the ventilation tower has got cracks in the brickwork, it is “not currently in a structurally unstable state”. The cracks could and should be repaired by specialists and the structure reinforced with an inserted steel frame. Retention and repair would be in line with Historic England’s reference to remnants of the original ventilating system illustrating the hospital’s “former role in treating consumption in mid-Victorian London” (letter, 5th May 2016 Heritage Statement pages 70-74). Furthermore, this letter does not encourage the “reintroduction of the original tower”, as stated on page 32 in the Planning Statement. It encourages “the reinstatement of the missing parts of the central tower above the principal range”. According to the applicant’s design and access statement (section 05), Historic England has agreed to the “reinstatement of the original spire”. As the spire was one of three features removed from the upper part of the original ventilation tower in 1934, it can be assumed that all three are to be reinstated, as also implied by the Heritage benefit “restoration and enhancement of… original ventilation tower” (page 33 Planning Statement). However, an annotation to a fabric removal drawing clearly states “Tower to be removed and replaced with a tower design to match the original tower spire design”. This is backed up by a statement in section 05 of the design and access statement indicating that the new ventilation tower would be “formed on a steel frame with new and reused masonry where appropriate”. In the developer’s June 2016 public exhibition and website, various demolitions and alterations to the 1892 sanitation tower were presented as “heritage enhancements” supported by Historic England. In fact, Historic England’s 5th May 2016 letter comments on the aesthetic value of the “octagonal north tower”. Fortunately, Crest Nicholson’s planning application indicates that the 1892 sanitation tower will remain more or less intact, and still attached to the northern end of the 1855 main building. It will be “enhanced for residential accommodation and small roof terrace”. The small single-storey, post-mortem room (next to the east of back side of the tower and referred to incorrectly as the chapel) “may house a small amenity space”. The Financial Viability Assessment (redacted version) concludes that it “is not viable to provide a policy compliant amount of onsite affordable housing, nor is it viable to retain the south wing”. The assessment also states that the 20.1% affordable housing (by habitable room) and the planning obligation pack of £1,501,136 are at the “maximum reasonable level in order to achieve a potentially viable scheme”. The affordable housing and some or all of the items making up the planning oblicaton pack are in the list of public and heritage benefits which “greatly outweigh the less than substantial harm resulting from the loss of the south wing” (section 6.53 Planning Statement). National Planning Policy Framework paras. 131 and 134 allow developers to argue that only so much of a nationally- listed building can be converted for the development scheme to be financially viable ie “a potentially viable scheme”. This usually means that all their costs have to be met and that there is sufficient profit for them to remain in business during down-turns in the building industry. In the case of the 1855 main building, the proposed five-storey back addition to the narrow three-story main building more than doubles the number of flats; the sale of which would probably meet all the developer’s costs and provide “sufficient profit”. But most if not all of the 18 flats in the new supersized roof would probably be for pure profit. The FVA fails to explain that it is not viable to provide six flats in the repaired original roof. Tower Hamlets Strategic Development Committee, therefore, has a clear duty to refuse consent for the demolition and replacement of the existing roof and the associated demolition and replacement of the existing ventilation tower, both of which make positive contributions to the significance of the Grade 2-listed 1855 main building and the Victoria Park Conservation Area. The former London Chest Hospital has been the centerpiece of the Crown’s Victoria Park Estate; and since the 1970’s, it has been the principal named building in the Victoria Park Conservation Area. The now doubly-protected building is to lose its very substantial south wing and it should at least have all its remaining parts properly repaired and adapted as a worthy memorial to the specialist hospital which served the people of North and East London for 160 years. All of the former Brompton Hospital, West London’s Grade II-listed specialist chest hospital, was converted to residential use without its roofs and towers being rebuilt. East London’s Grade II-listed specialist chest hospital, which was the only other hospital of this type built in England, should at least have its main 1855 building converted to residential use without its roof and tower being rebuilt. See especially section 05 in the Design and Access Statement; pages 31-42 in the Planning Statement; pages 44-56 and 70-74 in the Heritage Statement; Drawing no. 15047 PL 1350 existing main building elevation west; and Drawing no. 15047 PL 3350, proposed main building elevation, west). As many people as possible must please sign the online petitions, but there also need to be as many formal written objections as possible from groups and individuals. Email [email protected] quoting application numbers PA/16/13342 and PA/16/03343 and include your postal address. This newsletter is therefore being sent to the Victorian Society and all the other relevant amenity societies. Local tenants’ and residents’ associations must also please send formal written objections (with copies to your councilors). In writing these I hope you will find the online petition and and background notes useful, but you also need to study the planning applications on the Council website. PLEASE DO YOUR BEST TO SIGN THE ONLINE PETITION AS SOON AS POSSIBLE: THE COUNCIL WILL ACCEPT COMMENTS ETC AFTER THE DEADLINE OF 23 JANUARY 2017 BUT A MASSIVE IMMEDIATE RESPONSE WILL INTEREST THE MEDIA AND GENERATE MORE SIGNINGS AND FORMAL WRITTEN OBJECTIONS. The demolition of the repaired original 17th century country house-style roof (with gentle slopes and several flat tops), and the demolition of the original albeit shortened ventilation tower would result in the unacceptable loss of two external key elements of the 1855 main building, which is the most important part of the Grade II-listed former hospital building. The supersized new roof is only needed to provide about 12 more flats and with its steep slopes containing two tiers of dormer windows and one long flattish top it would be a grand city-type roof in conflicted juxtaposition with the 17th century country house-style façade; the new higher ventilation tower is only needed so that it can be seen above the taller new roof and, with its three added conjectural features, would also be taller than the existing ventilation tower. 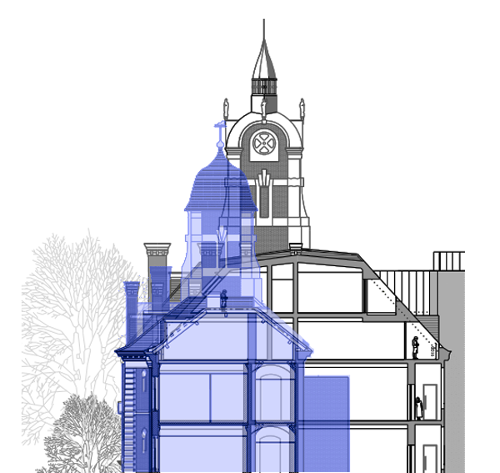 The fake heritage roof and fake heritage ventilation tower would be fundamentally dishonest and totally misleading; and would also be seriously detrimental to the significance of the 17th century country house style façade (the 1855 main buildings; third and only surviving key element) and its positive contribution to the character and appearance of the Victoria Park Conservation Area. The demolitions and replacements would cause substantial harm to the Grade 2 listed 1855 main building (and its Grade 2 listed 1892 sanitation tower) and harm the Victoria Park Conservation Area; and the substantial harm would not be outweighed by the proposed public and heritage benefits, which are being provided solely to outweigh the “less than substantial harm” caused by the demolition of the Grade 2 listed south wing. Tower Hamlets Strategic Development Committee should therefore please refuse consent (under NPPF Para 133) or defer its decision to allow the applicant to revise the application to include the retention and proper repair of the repaired original roof and the surviving lower part of the original ventilation tower and its 1934 dome. 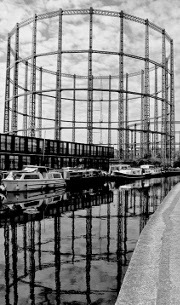 Regular readers will know that EEGW has tried and failed to save the No.1 gasholder in Poplar, on the River Lea, and the No.2 gasholders at Bethnal Green, on the Regent’s Canal. Like all nationally-unlisted gasholders in London they are to be demolished by National Grid; and Tower Hamlets Council (in its emerging Local Plan to 2031) still plans to have open spaces on the cleared sites at Bethnal Green (site allocation 22) and possibly at Poplar (site allocation 20). As a first step, we have written to the Borough Conservation Officer asking him and his colleagues to save the three gasholders. We hope that the little No.1 at Poplar will be retained in its entirety in the proposed open space, but at Bethnal Green we envisage the retention of the two gasholder guide frames (on their brick or concrete foundation) only, with the smaller No. 2 guide frame enclosing a playground for young children, and the larger No. 5 guide frame enclosing a multi-pitch. Attached to our letters are a report about the gasholder at Poplar and a report about the gasholders at Bethnal Green. The first report explains that the lattice guide frame at Poplar is of particularly strong local interest and that it is the oldest surviving example of its type in England; and that its lower tier of tapering box-lattice girders are the first and only surviving examples of their type in England. However, the first report failed to mention that the box-lattice principle established at Poplar was subsequently used in box-lattice girders and standards in later lattice guide frames, such as the No.5 at Bethnal Green. The second report explains that although the column guide frame at Bethnal Green has lost its classical details, it is the most beautiful of all the nationally-listed columnar types in London; also that the columnar guide frame and the lattice guide frame are the only surviving adjacent gasholder guide frames in London which represent the two main types of 19th century gasholder guide frame in London. However, the second report failed to mention that the lattice guide frame is also a particularly beautiful example of its type; and that the beauty of both complementary gasholder guide frames is enhanced by their reflections in the waters of the Regent’s Canal (both points made in letter to Borough Conservation Officer). To help the Borough Conservation Officer and his colleagues save the three historic gasholders, please sign the online petition by 1st January 2017 (for submission on the 2nd January consultation deadline for the emerging Local Plan). Unfortunately our previous petitions for the Bethnal Green Holder Station (1,494 signatures) and Poplar Holder Station (400 signatures) will not be considered for the emerging local plan - so please consider signing this new petition. Since the Special October Newsletter, a November Supplement has been published, followed by a Post-Script to the November Supplement. All three have either been e-mailed to you via the East End Waterway Group OR may be viewed on www.residents-first.co.uk. Please read all three and send your email to the four addresses listed below, as soon as possible, as the developers have submitted their planning application to Tower Hamlets and it is likely to be validated shortly. give serious consideration to requests for 35% “affordable” housing and other substantial public benefits which you think necessary to outweigh the loss of the south wing of 1865 (at right angles to the south end of the main building of 1855 and facing the eastern end of Bonner Road. 2. Protected historic building should be conserved and adapted for new uses. The maximum amount of historic fabric should be retained with the minimum amount of replacement or additional fabric – so that significance is preserved and former uses can still be appreciated. Furthermore, all necessary additions should be designed to sympathise with and not match the protected historic building. 3. 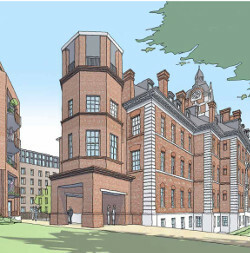 The proposed back addition on the main building of 1855 is an unusually massive addition and should only be supported by Historic England and allowed by Tower Hamlets provided that it looks like an addition and has a flat roof to distinguish it from the existing roofs on the main building. These roofs are capable of repair and should not be demolished as they contribute to the significance of the 1855 building. 4. With respect to the adjoining of 1892 (and for the reasons set out in the above statement), Historic England should not support and Tower Hamlets should not allow the various demolitions and extensive alterations which would turn it into a detached ‘feature’ without significance and no sense of original purpose. 5. London’s only other and slightly earlier chest hospital: the Brompton Chest Hospital (Grade II) in West London has been conserved and adapted for residential use. We must ensure that the London Chest Hospital (Grade II) is also treated with the same respect so that the two retained parts of the listed building do not suffer substantial harm to their significance and integrity; and are a proper memorial to the specialist hospital which served the people of north and east London for 160 years. 6. With respect to the substantial provision of genuinely ‘affordable’ housing as a substantial public benefit to outweigh the loss of the south wing, I have been advised that 35% would be a more realistic target than the 50% mentioned in the Supplement. 7. The planning application could be validated in about a week’s time, followed at some time by a 21 day consultation period. As soon as I am able to see the planning application I will write my own letter of objection in the hope that others will follow suit. With the help of others I will also write a petition on heritage issues and a petition on other issues. I hope that the draft petitions will be discussed and agreed at a public meeting in the locality and that there will be paper and online versions. This supplement provides further information for those who have already sent their email (for which many thanks) and for those who have still to write – please do so as soon as possible. Please note that this is not an East End Waterway Group campaign. I am using the newsletter service to make as many people as possible aware of the proposed development in the Victoria Park Conservation Area (LBTH). And hope that organisations and individuals will want to persuade the developers to change their proposals before submitting them to Tower Hamlets Council; and persuade Historic England to reconsider its support for demolitions and extensive alterations to the recently listed former London Chest Hospital (Grade II). Historic England has issued a statement in response to the Special October Newsletter, which does not comment on the accusation that it is now pursuing a ‘protect and destroy’ policy, and only says that the developer will have to justify the proposed demolition of the south wing (1863-5). Also that Historic England “will be providing … formal comments on the scheme“ when the planning application goes out to consultation. Presumably those comments will be made by the same inspector who has supported the developers’ proposed demolition of the south wing; and the so-called “heritage enhancements” to the main building (1851-5) and sanitary tower (1890-2) which would cause substantial harm to their significance as the surviving parts of a designated heritage asset in a conservation area. Hence the need to email now and help publicise the protection and destruction of the former London Chest Hospital. Please bear in mind that when it gets to the consultation stage, objectors will not have an opportunity to comment on Historic England’s formal comments. Although the roof is not described in detail in the List Entry Description (no. 1433870) it consists of five hipped cut roofs and the hipped cut roof is a characteristic feature of the late-17th century country house style referred to in the List Entry Description (Here and Here).. Drawing No. 1 shows a cross-section of the narrow three-storey main building through one of its five hipped cut roofs and the proposed back addition (shown on the developers’ page 4 plan but not described or explained). The proposed demolition of the existing roof would cause substantial harm to the significance of the designated heritage asset (listed building) and the three-storey main building in particular. The existing roof’s proposed replacement by a taller and wider roof with only one long flat leaded roof would also cause further substantial harm to the significance of the designated heritage asset by creating fake heritage. And this would be further compounded by the fake heritage of a “reinstated original spire” on the central or ventilation tower. This was described incorrectly as a three-storey tower in the Special October Newsletter. In fact, it is a four-storey tower; and as shown on Drawing No. 2 the attic or third storey is to be converted to a gazebo. The tower, together with the link building and single-storey post-mortem room (not “mortuary”) is fully described in the List Entry Description here . 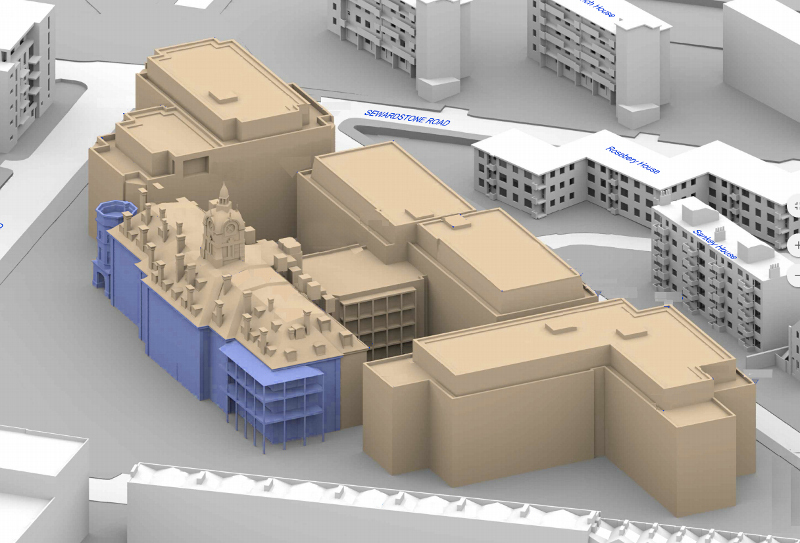 The proposed partial demolition of the rectangular ground storey and attic storey and the total demolition of the link building and post-mortem room are indicated in Drawing No. 2. With the possible exception of the single-storey post-mortem room, the demolitions and subsequent alterations to the ground and attic storeys would cause substantial harm to the significance of the designated heritage asset (listed building) and the four-storey tower and link building in particular. The proximal old mulberry tree should not be relocated. With respect to the main building and tower, if you have still to send your email, please write along the lines set out in the Special October Newsletter, with references to the additional points made in this supplement – especially the five hipped cut roofs on the main building, link building and the sanitary tower’s attic storey. As a consequence of its new policies on the Old Ford Estate, Circle Housing has been struck off Tower Hamlets’ list of preferred housing associations (in joint ventures with developers). This will probably not stop Circle Housing and Crest Nicholson from making their planning application but questions are being raised about Circle’s suitability as a registered social landlord in the proposed residential development of the former hospital. The developers have yet to provide details about the provision of social or genuinely affordably housing and local residents are questioning whether or not the hospital development is yet another example of a housing association building homes to make money for the provision of social housing elsewhere. The proposed demolition of the south wing constitutes substantial harm to the significance of the designated heritage assets(List Entry Description under History and Exterior). Should Tower Hamlets grant planning permission for the demolition of the south wing, it is to be hoped that, in line with National Planning Policy Framework para 33, the loss would be outweighed by substantial public benefits. As local residents are calling for the maximum provision of social housing in the hospital development, the substantial public benefits could include Mayor Khan’s 50% affordable housing. Tenants and residents groups in the vicinity of the former hospital emailing the developers and Historic England (copies to Owen Whalley Tower Hamlets and Tom Ridge c/o East End Waterway Group – all email addresses in Special October Newsletter) about the need for the proper conservation of the surviving parts of the designated heritage asset may also wish to specify the substantial public benefits which they think are needed to outweigh the loss of the south wing. Also the other issues which they think need to be addressed. This supplement (and the Special October Newsletter) may also be viewed on residents-first.co.uk, press East End Waterway Group button and select. The listed building(s) is/are shown coloured blue on the attached map. Pursuant to s.1 (5A) of the Planning (Listed Buildings and Conservation Areas) Act 1990 (‘the Act’), structures attached to or within the curtilage of the listed building (save those coloured blue on the map) are not to be treated as part of the listed building for the purposes of the Act. The building may lie within the boundary of more than one authority. National Park: Not applicable to this List entry. Date of most recent amendment: Not applicable to this List entry. This list entry does not comprise part of an Asset Grouping. Asset Groupings are not part of the official record but are added later for information. The former London Chest Hospital, a specialist hospital built in 1851-5 to the design of F W Ordish, with G Myers as builder, including the cast-iron verandahs of 1900, the South Wing of 1863-5 and sanitary tower of 1890-2, together with the Victorian gas lamp, dwarf wall, railings and entrance gates. Other additions belonging to the later C20 and C21 are excluded from the listing. * Architectural interest: built to a dignified design in late-C17 style, the frontage incorporates accomplished sculpture, attributed to the workshop of George Myers; * Historical interest: as one of the earliest dedicated to diseases of the chest, the hospital was founded by City philanthropists, mainly Quakers, to combat consumption in north and east London; * Planning interest: the main range and south wing largely retain the plan distinctive to chest hospitals of this date, with wards opening from one side of wide corridors for exercise, reflecting the greater mobility of most chest patients, and the treatment favoured in the mid-C19; thethe scale of the new hospital was reminiscent of a country house or mansion rather than a palace small WCs accessed from some wards, for use by less mobile patients, represent a rare feature; * Internal features: the main entrance is impressive, with noteworthy carving in stone and wood, as well as vaulting ingeniously executed in hollow fireproof bricks, whilst the main and subsidiary stairs are of considered design; other surviving features include piscenae in areas of circulation, and fireplaces in wards; * Technological interest: the former hospital building retains dials relating to an annunciator system, installed for communication purposes, and thought to be a rare feature; * Contemporary ironwork: the site retains high-quality contemporary ironwork, including elaborate stair-rails, area railings, and the railings (incompletely) enclosing the site, together with an entrance gateway to the site, and a gas lamp; * Group value: the hospital stands directly to the south of the 1840s Grade II*-registered Victoria Park, with its numerous listed features; to the east is the Church of St James the Less of similar date, and to the south is Raine’s (originally Parminter’s) Foundation School of 1887; listed terraces of the 1860s line the southern portion of Approach Road. The building known since 1923 as the London Chest Hospital, originally the City of London Hospital for Diseases of the Chest, was founded in response to public concern at the inadequacy of provision for treating consumption or tuberculosis (then known as consumption or phthisis) in smoke-bound mid-C19 London. The Brompton Hospital had opened in 1846 as the first major specialist hospital of its kind; consumptive patients were denied access to other hospitals on the grounds of alleged contagiousness, and were generally treated at home. The need for a comparable facility for north and east London and the City, home to greater numbers of poorer people, particularly vulnerable to tuberculosis, was very great; the small Infirmary for Asthma, Consumption and other Pulmonary Diseases, founded in Spitalfields in 1814, was wholly inadequate. A public meeting on the subject held in March 1848 gave rise to a committee of City bankers and merchants, with Henry Gurney, of the prominent Quaker family, as treasurer; 13 of the original 19 members were Quakers. The aims of the founding committee were threefold: to establish a hospital for in-patients in a salubrious situation accessible from the City; to provide accommodation for those who, though not the very poorest, would not otherwise be able to procure the necessary medical attention; and to maintain a public dispensary where those suffering from chest problems might receive free advice and medicine. The Brompton Hospital had been intended to treat only tuberculosis cases, but in practice admitted patients with a wider range of chest complaints; it was intended from the outset that the new hospital would have this wider remit. Funds raised allowed a dispensary to be opened near Broad Street Station in June 1848. The following year, a four-acre triangular plot was leased in Bethnal Green; though then in use as a rubbish tip, this had been the site of the Stepney manor house, once home to the Bishops of London, but demolished in 1848, and was adjacent to the newly-created Victoria Park. (An ancient mulberry tree in the grounds has been associated with the C16 Bishop Bonner, but arboreal research suggests it is more recent.) A competition for the design of the hospital drew entries from 12 architects; the successful applicant was Frederick W Ordish (1822-1885). Originally from Leicester but then practising in London, Ordish’s work consisted largely of churches and church restorations; this was his only hospital commission. The builder chosen was George Myers, best-known for his work with A W N Pugin; Myers had recently completed the asylum at Colney Hatch (S W Daukes, 1849-50), and worked on a number of other asylum and hospital projects at this period, including the Royal Victoria Hospital at Netley (R O Mennie, 1856-3). A strong historicist element was present in hospital design of this period – F J Francis’s Brompton Hospital was Tudorbethan – and the late-C17 style chosen referred to a strong tradition of hospital building; Robert Hooke’s London hospital buildings, particularly Bethlem Hospital, Moorfields, had been very influential, whilst an announcement in The Times (26 June 1851) of plans for the Bethnal Green hospital noted that the structure was to bear a striking resemblance to Wren’s Royal Hospital at Chelsea of 1682. However, the scale of the new hospital was reminiscent of a country house or mansion rather than a palace. The building is notable for its sculptural enrichment, in ecclesiastical style; Ordish was used to employing detail of this sort through working on Gothic churches, whilst Myers’s workshop produced much architectural sculpture for Pugin and others, and it is thought that the carving at the hospital is likely to have come from this source. In 1850 Queen Victoria and Albert, Prince Consort, agreed to be patrons of the hospital, and on 15 June 1851 Prince Albert laid the foundation stone. Ordish had made it clear at the outset that he could not provide a suitable building for the £8000 allowed; the final total cost was alleged to exceed £30,000, though The Builder (21 April 1955) put the sum at about £17,200, attributing the increase to “the anxious desire of the committee to make the internal arrangements as perfect as possible”, the intention being that the hospital should be “as far as possible a model of its kind”. Joseph Paxton’s 1851 design for a ‘Crystal Sanatorium’ – a glass and iron air-conditioned exercise pavilion – had to be abandoned due to cost. The out-patients’ department was in operation from March and the first in-patients were admitted in July of that year. The hospital originally consisted of a single main block, providing accommodation for 80 patients in wards with between four and eight beds ranged along the west side of the building; women were on the first floor and men on the second. Running along the east side of the building was a wide corridor, used as an exercise area and day room (described in the ‘London Journal of Medicine’, 1851, as “wide, lofty and cheerful exercising corridors”) with separate day rooms at the ends of the range; this arrangement, used at the Brompton Hospital, and at the time considered the best for treating chest patients, was similar to contemporary planning for lunatic asylums. Sanitary facilities were in spurs on the eastern side of the corridor, to north and south. Uniform temperature and good ventilation were important factors; in addition to fireplaces, a complex system was installed by W Jeakes, by which cold air was heated under the basement, and then ascending through hot air channels in the spine wall, was let into the wards through vents at floor level, the foul air being extracted through vents near the ceiling, and led through ducts and trunking to be expelled through the tower. A similar system by Dr Arnott was more widely used in institutions of the period, but had been found unsatisfactory at the Brompton by 1851, when George Haden introduced an improved system. 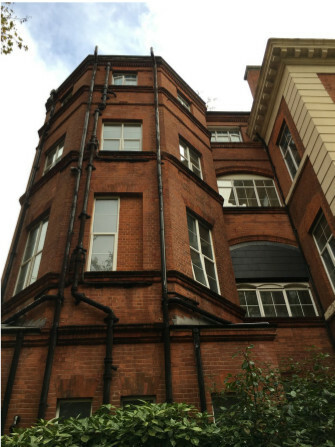 At the London Chest Hospital, very little visible trace of the system remains, other than the ventilation tower, which was truncated in 1934, though further evidence may survive beneath the basement, and in the walls. On the ground floor, the out-patients’ department was to the south, with offices and a library and pathology museum. The hospital received a number of additions, soon after completion, and later. A chapel was added to the north by E B Lamb in 1858-60; this was destroyed by bombing in 1941. It was the intention, at least from 1855, that two ward wings would be added when funds became available, creating a U-plan in the manner of the Brompton, and in 1863-5 the first of these, to the south, named the Albert Wing, was built to the design of William Beck; a corresponding wing was built to the north in 1871, but was destroyed at the same time as the chapel. These wings contained large day rooms, and had large wards at their east ends, with windows on three sides. Towards the end of the C19 the existing sanitary facilities, not properly disconnected from the main building, were inadequate, and two octagonal flanking towers were planned; only the northern one was built, in 1890-2. At the same time, a mortuary and post-mortem room was constructed, replacing facilities in the basement of the main building. In 1900, in line with more advanced thinking about tuberculosis treatment, and the benefit of fresh air, external iron balconies were added to the south-west corner of the building, capable of holding eight beds on each floor; these have since been enclosed. In 1905 nurses’ accommodation was built to the east of the site; the building was partially destroyed in 1941, with subsequent rebuilding. Further additions were made to the rear of the main building in the 1920s and 1930s. In 1972 a new outpatients’ department was built to the south of the main range, with an octagonal tower reflecting the design of the northern sanitary tower. The north wing was replaced in 1983, and there have been subsequent additions to the main building as well as extensive alterations internally, and the replacement of all the windows. A number of detached blocks have been erected in the grounds, including staff accommodation, an Institute building, and pathology and administration space. In 1897 Sir Mancherjee Bhownagree, MP for Bethnal Green, presented a bust of Victoria, Queen of England and Empress of India, to be placed in the grounds to commemorate the sixtieth year of her reign. Only the granite pedestal remains. The hospital closed in April 2015. The former London Chest Hospital, a specialist hospital built in 1851-5 to the design of F W Ordish, with G Myers as builder, including the cast-iron verandahs of 1900, the south wing of 1863-5 and sanitary tower of 1890-2, together with the Victorian gas lamp, dwarf wall, railings and entrance gates. Other additions of the later C19, C20 and C21 are excluded from the listing. MATERIALS: red brick, laid in English bond, with Portland stone dressings; the roof is slated, with sprocketed eaves on a block cornice, and there are tall brick stacks. The original small-paned sash window frames have gone; the current windows are all UPVC. The ironwork is by Messrs E & R Dewer of Old Street. The later additions are mainly also in red brick. The areas of the main range are enclosed by cast-iron railings, with a single rail supported on bracketed uprights, with three-dimensional hexagonal joints. PLAN: the main range is roughly rectangular, set on a north/south axis, the principal elevation facing west, with the 1900 verandahs wrapping around the south-west corner. Extending eastwards from the south end is the 1863-5 wing. To the south-west of the main range is the Victorian gas lamp. To the north of the south wing, the extensions* dating from the 1920s/1930s, with a later addition* reaching into the angle with the main range, are not of special interest. The corresponding north wing* is a replacement of 1983 and is not of special interest. There is an octagonal sanitary wing of 1890-2 at the north end of the building, with a bridging link. The contemporary mortuary is attached immediately to the east. On the eastern, rear side of the building, is a large, multi-phase C20 addition*, extending from the centre of the building. Between this central extension and the south range, against the eastern face of the main range, is a later-C20 lift tower*. Between the central extension and the north range is a C21 stair tower*. Attached to the south-east end of the south wing is the octagonal tower of the 1972 outpatients’ building*, with a large single-storey block* extending southwards. None of these C20 and C21 additions is of special interest and they are excluded from the listing. None of the separate C20 and C21 buildings standing within the site is of special interest and all are excluded from the listing. Dwarf walls with railings surround the majority of the triangular site, with the entrance gates being to the south west. EXTERIOR: the main range, being three storeys with attic and basement, is of seventeen bays. On the principal, east-facing elevation, the bays are symmetrically arranged, in three projecting stages, with a five-bay central section, two bays set back to either side, and a further four outer bays set back to either side of that; the separate sections are defined by stone quoins, and the storeys by string courses. The first stage of the frontispiece consists of a rusticated arched doorway with a concave-moulded round-headed arch; the keystone consists of three staggered scrolled brackets, each having a carved head beneath, supporting a pair of draped figures set against a foliate ground to each side, with a standing figure ministering to a seated one. The central female figure is a later replacement of circa 1900. The window cill above is supported on corbels enriched with serpents, emblematic of medical practice; the window has a stepped surround and a segmental pediment containing a cartouche bearing the initials V R. Above this, the second-floor window has a bracketed keystone decorated with a serpent and with an angel beneath, supporting a figure of Christ, perhaps replacing an earlier figure. The door opening contains the original pair of eight-panelled oak doors, in a frame of naturalistic carving, with leaves, flowers, birds, frogs, and snakes. The fanlight has an ornate central bracket, supporting the keystone; the base of this is carved with the initials F O. The entrance is approached by a flight of steps, bridging the area; these have ornate wrought-iron railings, with tall lanterns to the end piers. The window openings are of equal height, with flat arches of stepped gauged brick, those to the central section having unusual double arches; the windows to the central section have carved stone mullions, each with an angel entwined by a serpent in an elaborate niche to the top, supported on a tall, narrow, barley sugar column with a foliate capital. One half of one of the second-floor windows is blocked. The projecting sides of the central section have window slits, serving small corner WCs to the ward floors, and cupboards to the ground floor. The basement windows have stone mullions, and defined keystones. The building originally had three dormer windows with segmental heads to the central section; further dormers have been added since, in all but the southern section of roof. The tall rectangular stacks originally had stone capping; this was replaced with brick in the early C20. Rising above the centre of the building, from the back part of the roof, is the ventilation tower, now truncated. This originally had three stages, in a hybrid Baroque style, of which only the first remains: this has stone corner pilasters, with tiny heads to the upper corners, and stone dressings between framing what appear to have been narrow openings, now blocked; above this an arched stage and cupola have been lost, being replaced by a copper dome of ogee form. Attached to the southern section, and wrapping round the corner to the south elevation, are the cast-iron verandahs installed in 1900; accessed from the first and second floors, the verandahs are supported on slender columns with scrolled capitals. Though now infilled with timber and glazed panels, the original structure appears to survive. The south elevation of the main range is of three bays with a central entrance, the oak door being like that to the west, in a simpler surround, and with comparable, though less elaborate, railings. The detailing is otherwise as on the west elevation. The 1863-5 south wing closely emulates the style of the main range. The central three bays are slightly recessed, and have a plain rather than a block cornice. The ground-floor windows to this section are round-headed, in arched recesses, whilst those to the first and second floors have chamfered stone mullions, without the carving of those to the west. The flat window arches take the same form as those of the main range. The eastern section, mirroring the south elevation of the main range, has a central doorway originally leading to the women outpatient’s waiting room; this part of the building is now obscured by the 1972 outpatients’ wing*. Against the east elevation of the south wing is a metal fire-escape. The original north elevation of the main range is obscured by the 1890-2 sanitary tower, which is octagonal, with a rectangular ground-floor block; the link between the tower and the main range has large arched windows at ground-, first- and second-floor levels, with a shorter rectangular window to the attic storey. The tower has a brick dentil cornice, moulded string courses, and the windows have flat brick arches; several of the windows are partially blocked. A ventilation shaft rises against the eastern side of the tower. Attached to the east side of the sanitary tower is the single-storey mortuary, with a pitched glazed roof. This has a large central segmental-arched window, and a blocked doorway; the openings are edged with moulded bricks, and there is a convex cornice. Immediately to the east of the mortuary is a narrow section of rag stone walling, with a chamfered ashlar edging; thought to be a fragment of Lamb’s bombed chapel, this now forms part of a small C20 body store. To the rear of the hospital, portions of the original building can be seen, between the C20 additions. INTERIOR: the main entrance leads to the entrance hall; this has a barrel-vaulted ceiling with geometric compartments, and a stone floor. The sculptural enrichment of the front elevation is continued in this area of the interior. To either side of the hall is a square-headed doorway with a carved stone surround similar to that of the front doorway; the inner faces of the front doors have decorative brass hinges and heavy brass bolts received by carved lion heads, one missing. To the south of the doorway is the foundation stone, commemorating the occasion of its laying by Prince Albert. A deep archway – segmental to the outer face and round-headed to the inner face, having a hoodmould with foliate stops – leads to the stair hall. The depth of the arch reflects the fact that dumb-waiters originally passed through the wall thickness at this point. In the stair hall the groin-vaulted ceiling is lined with hollow hexagonal fireproof bricks of a sort used a number of times by Myers in asylum buildings. The stair wing is accessed through paired round-headed archways, with bearded heads to the keystones; the capital to the pier between the archways is carved with the pelican in her piety, goblets, and a head, apparently that of Bacchus. Attached to the east face of the pier is a pedestal holding a horizontal brass dial numbered from one to thirteen: this is understood to be part of an annunciator system in use in the hospital, designed by Henry Grafton, and installed to aid communication for deploying medical staff, the wider system including the convex dials, now painted over, found at either end of the main first- and second-floor corridors. Such a system would have been likely to have had a central control panel, distributing signals to all the dials. The cantilevered open-well stair has an open string with decorative paired cast-iron balusters and a wreathed handrail; sections to the landings have been replaced, possibly indicating openings for access to a pulley. Above is a pyramidal roof, with plaster mouldings and an opening for light. Towards the north and south ends of the main range, secondary stair towers project eastwards (now enclosed by later building*). The tight open-well stairs have sturdy starter newels, carved with vines and acanthus, and plain iron balusters. The south entrance leads to a vestibule with a segmental ceiling lined with hollow hexagonal bricks, as in the main entrance hall. The ground-floor corridor has an incised skirting as elsewhere in the main range and south wing; here the moulding is more complex. The floor here has been replaced, as have a number of floors within the historic parts of the building. To the north of the hall, two large archways originally led to the porter’s room and ante room; these have iron fanlights with lion’s head decoration, possibly re-used. The ground-floor rooms have long ceased to serve their original functions, and several have been subdivided: the hospital’s offices, board room, library, resident medical officer’s room, and out-patients’ waiting rooms were here – a reminder of the higher status of these rooms survives in their panelled window embrasures and shutters; the building has false ceilings throughout so any surviving mouldings are hidden. On the first and second floors, the stair is separated from the corridors by large archways with heads to the keystones, containing glazed double doors. These open to vestibules with segmental ceilings lined with hollow hexagonal bricks. Opposite the stair are the rooms over the hall, formerly the ward kitchens. These are entered through arcaded crossings, the arches to north and south formerly giving access to the dumb waiters which communicated with the kitchens in the basement. The wards on the first and second floors of the main range, entered through segmental-arched doorways, mostly retain their original proportions, but have few original features. The medium-sized wards, in the middle sections to north and south, have the small connecting WCs; it is thought that these wards were for those who were too unwell to reach the facilities in the spurs. Two first-floor wards retain timber chimneypieces, with dentilled mantelshelfs, now partially boxed in; one ward has low-level vents with modern covers, probably a surviving trace of the original ventilation system. Chamfered beams can be seen to the ceiling in one second-floor ward. The South Wing is entered directly from the south end of the main range. On the ground floor, the former consulting rooms and waiting rooms have undergone much subdivision, and retain few original features; the fireplaces have gone. In the corridor there is a stone piscina, its bowl infilled, standing opposite the archways, clearly used for drinking water or for washing. On the first and second floors, the original plan, seen on the second floor, had a corridor to the north, opening at the centre with two large arches leading to a day room, also used as a dining room. These features are embellished with sculpture comparable in style and quality with that found in the main range: there are heads to the keystones and foliage to the capitals. On the first floor, the corridor has been moved to the south, but the arcade is still visible. There is another stone piscina, also infilled, standing opposite the archways on the second floor; that to the first floor has been lost. At the entrance to the south wing on the first floor is a large glazed terracotta plaque, commemorating Prince Albert, and announcing the Albert Wing; this has been moved with the repositioning of the corridor. In the attic, a chamber gives access to the ventilation tower. To either side of this, the roof trusses are chamfered, confirming that the central space was used, probably for nurses’ bedrooms, from the first. In the area immediately to the south is a chimneypiece, probably inserted for the conversion of that space later in the C19. In the north part of the main range the conversion of the roofspace is evidenced by two small cast-iron late-Victorian or Edwardian chimneypieces. The basement is reached by the secondary stairs, with a separate stair from the south wing formerly lit by a traceried screen, now infilled. The basement retains few historic features, but the kitchen space is still legible, with the crossing for the despatch and receipt of the dumb waiters. The sanitary tower has been refurbished, but in 2015 retained its original function and layout, with the top floor having been converted to therapeutic use. By the south-west corner of the building is a CAST-IRON GAS LAMP, with the maker’s name and date to the pedestal: ‘DEWER / LONDON / 1855’. The lamp has a slender tapered column, with laurel ornament to the base and neck. The lantern is a replacement. The site is enclosed by a DWARF WALL of brick with stone coping, in which are set CAST-IRON RAILINGS contemporary with the building, by Messrs E & R Dewar of Old Street. The main entrance, to the south-west of the site, has double gates with gas lamps as piers, the upper stage of scrolled wrought iron; the lanterns are replacements. The railings and gates have spear-heads, in alternating smaller and larger size, and dog-bars. The regularly-spaced bracketed uprights have three-dimensional hexagonal finials, topped by spikes. The railings are set on a dwarf stone wall. A section of the wall and railings is missing, running northwards from the centre of the eastern boundary, and then southwards to a point on the eastern boundary. The gates at the south-eastern entrance have been replaced. * Pursuant to s.1(5A) of the Planning (Listed Buildings and Conservation Areas) Act 1990 (‘the Act’) it is declared that these aforementioned features are not of special architectural or historic interest. This copy shows the entry on 21-Nov-2016 at 01:43:07. In November 2015, the Victorian Society applied for the former hospital to be listed. The following month, Historic England received an application, on behalf of Circle Housing and Crest Nicholson, for a Certificate of Immunity from Listing. Both applications were considered by HE but the second application was paid for by the applicant under HE’s enhanced Advisory Services. In March 2016, a consultation report was issued by Historic England and the following month the main building (1855), south wing (1865) and octagonal sanitation tower (1890–2) were listed Grade II. The former hospital is also a named building in the Victoria Park Conservation Area. At the developer’s second public exhibition (in June 2016), local residents and others were informed that Historic England is now “supporting” the proposed loss of the listed south wing, together with proposed “heritage enhancements” as set out in full on page 4 of the June exhibition document on the developer’s website (see also page 3 for a view of the reinstated and enhanced sanitation tower). Circle Housing and Crest Nicholson hope to submit their planning application to Tower Hamlets Council towards the end of this year. By this stage it is usually too late for local residents and others to suggest any significant changes. As a local historian who responded in detail to the HE consultation, I am appalled by Historic England’s ‘protect and destroy’ approach to our built heritage. Mindful of the fact that the redevelopment would deliver “up to 395 homes including affordable homes” I regret but accept the loss of the south wing. 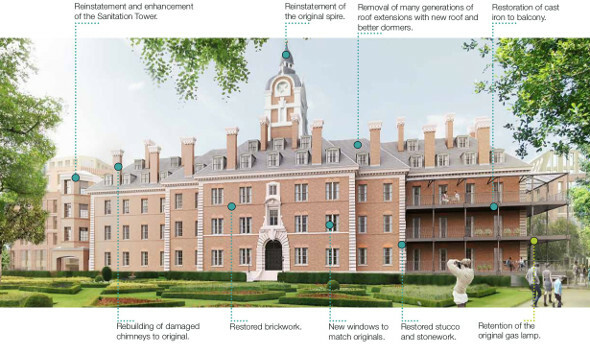 I also understand the new build alongside the corridors at the back of the narrow main building but regard the proposed “new roof and better dormers” as totally unacceptable. Most of the several original roof structures survived WW2 damage and the “many generations of roof extensions” were probably internal alterations to increase the number of attic bedrooms for nurses. The integrity of this listed building requires the retention and repair of the existing roof and dormers. And the proposed back addition should have an honest flat roof not a long roof slope as part of the proposed new “double height” roof (which is double the existing width to maximise the number of one-bed attic room flats). The rebuilding of the top part of the central tower in the 1930s is also part of the historic building’s history and it should not suffer the proposed “reinstatement of the original spire”, which would be an unnecessary and misleading replica. English Heritage used to promote a conservation-led approach but it would appear from the “heritage enhancements” set out on page 4 of the document that Historic England favours the replacement rather than the repair of worn or damaged historic fabric, especially when it is considered necessary for an old building to look as new as the new buildings in a speculative residential development.